Beautiful minimalistic table tennis table that can also double as a desk, table or work surface. RS Barcelona table tennis tables are built in Spain to the highest possible standard. RS Barcelona have been manufacturing table tennis tables and football tables for 40 years. RS Barcelona was founded by Rafael Rodríguez Castillo, who was a metallurgist until in 1975 he decided to start his own business. He began in a small workshop before upgrading to an industrial unit in Viladecans, Barcelona, where he took on his two sons as part of the business. RS Barcelona make only a single table tennis table, albeit in a variety of sizes, but it's clear at first glance that the Stationary is a table worthy of note. The RS Barcelona Stationary Table Tennis Table is a beautifully minimalistic table tennis table. Suitable for use both indoors and outdoors, the Stationary table is made from steel that has been treated with a cataphoresis coating process, making it hard-wearing enough to survive outdoor conditions, and is available in a choice of two fantastic colours in polyester paint. As standard, the Stationary comes in a choice of either black or white. If this isn't enough to satisfy you, the table can be recoloured in almost any finish you desire, from the standard RAL choices. With this option, you can have the beautiful Stationary table coloured to match any environment you like. If you would like to take advantage of this option, please contact one of our experts on 0800 622 6464 to discuss your colour choices and costs. 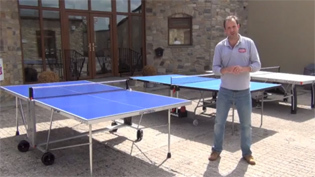 RS Barcelona's table tennis tables all come with free delivery and installation to most locations within mainland UK. We will bring your table to your house, office or other chosen location, unpack and assemble it, and take away any packaging materials. All you need to do is sit back and wait while your brand new table is installed, and prepare yourself for a fantastic game of table tennis! For locations further north than Glasgow or in Cornwall there may be an additional charge depending upon your exact location. Please call our friendly customer service team on 0800 622 6464 for a quotation. It is also possible to deliver and install the table to a location with difficult access - loft conversions, basements, upstairs, downstairs, up and down steep slopes etc - but this will be at an extra cost. Please call us to discuss your exact requirements and we will happily provide you with a quotation. If you are looking for some expert advice, either on RS Barcelona Table Tennis Tables or on any of our other products, please just give our friendly team of advisors a call on either our freephone number 0800 622 6464, or on our main line number 01454 413636.